We all have workplace struggles. And Working America wants to know what's hurting you. Is it a bad boss? Bad pay? No vacation time? We want to know, because we're here to help you on the job. Working America wants to be a resource for your problems on the job. And later this spring, we'll be launching the full fixmyjob.com, which will be the new go-to home for tools to improve your workplace and knowledge of how best to do it. We want to hear from you. 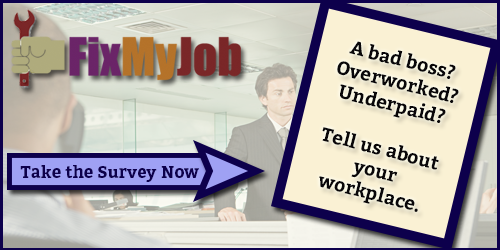 Will you fill out our survey and let us know about your workplace? All of your answers will help us bring you the tools that will help you the most. Or sign up to be notified when the full fixmyjob.com site launches. By entering your email address you become a member of Working America, a powerful voice for working people. As a member, you will receive updates and information about how you can make a difference for working families.